Questers or Questaria, sometimes the western Commonwealth and in official documentation, the Raj, is a stateless polity in eastern Crataea, with seaboards on the Axackal Sea, the Oryontic Ocean, and the Hanin Sea. Questers borders Dumanum to the west through Yehud, Uiri, Sharfland and Hakara to the south-west, and Taihei Tengoku to the south, as well as being geographically proximate to Varnia across the Axackal Strait and Hanseom over the Hanin Sea. With more than 350 million inhabitants, Questers is the 2nd-largest country in the world by population, and spanning 3,891,275-sq mi, is the largest country in the world by area. Questers is a multi-racial, multi-ethnic and multi-religious country and is also highly diverse by climate. Like the 'mother country' and colonial parent Praetonia no state entity claims a jurisdiction over the area that makes up Questers, and its own borders are defined by the borders of neighbouring states; Questers has no central government to establish de-jure borders and does not have a constitution. Governing authorities are landowners, who swear allegiance to a central royal family in a system referred to as Rajamandala. By its position at the centre of the world, and a crossing point between continents, Questers has played an instrumental role in world history, and by its large population, economy, and armed forces, exerts significant cultural influence. Some consider Questers, as a common law country, to be a a part of one country known as the Commonwealth alongside Praetonia and North Point. A lack of border controls between these countries has historically facilited, and continues to facilitate, compelling cultural, social, and economic integration. Without a central governing authority, economic estimates are difficult, but Questers' GDP is assumed to be approximately $6,650 billion, making it one of the richest countries in the world by gross domestic product. Questers is significant less developed per capita than most Wallasean countries, a consequence of historic inter-racial strife, war, natural disaster, and other social and religious problems. More than half of Questarians are Dharmans, an eastern Crataean Polytheistic religion. Malays make up another twenty percent, and the descendents of Wallasean settlers, make up another ten percent; these two groups are firmly Providentialist. Other Crataean minorities are prevalent; in recent decades, Questers has absorbed significant numbers of refugees from around the world, in large part to its multi-cultural heritage and total lack of border controls. Some countries with strict border controls deport refugees to Questers, especially those who lack documents, and there are significant communities in the country's major cities which have prospered. The term Questers comes from the old Dharman term for Crataea, Kretshyas. The term was Praetannicised into Keretsers and finally into Questers. The term Questaria for the country is common in both Praetonia and North Point, and is an adopted identity by whites in Questers, especially those of Praetonian or Cockay descent. Before the settlers, the official term for the whole of north Questers was Dharmandesh (धर्म देश), literally Country of the Dharmans in the Mogami and Axackali languages. Other minority languages of north Questers have similar names; in Charnadi and Mahani the country is called Dharamandesa. Southern Questarians referred to their own regions by their general names, and used a form of Dharmandesh to refer to the north of the country. Since Questers is not a state polity and lacks a core nationalist identity, the words used by people to refer to the country as a whole are largely dependent on their own racial, ethnic, or religious identity. In particular, many people in the Commonwealth do not consider Questers, Praetonia, and North Point as being separate countries, but as being regions of the same country, referring to them as the Western and Eastern Commonwealth respectively, with North Point sometimes being referred to as the Commonwealth Islands and Praetonia even as the Home Islands. The Yamuna, one of Questers' many rivers. Almost 1/6th of Questers is 3,000 feet above sea level or higher. With a total area of 3,891,275 sq-mi (6,262,400 sq-km), Questers is the largest country in the world by square area, and is commonly referred to as a subcontinent, especially as it lies to the far east of the Crataean continent, facing the Oryontic ocean and across the Axackal strait. Questers lies across the northern part of the Axackal tectonic plate and straddles the Charatry plate; tectonic plate movements approximately 70 million years ago caused the formation of the large mountain ranges that characterise the border with Taihei Tengoku. These mountains opened up two very large drainage basins; the Herat basin in the centre-east of Questers and the Nampata basin on the border with Yehud, draining into the Oryontic ocean and Axackal Sea respectively. The high fertility of these two basins allowed for the growth of distinct mega-diverse biospheres with high levels of endemism. Questers has more than 40% of the world's total species of flora and fauna, including 20 million species of plant and insect found in no other country. The south and east of the country are populated by dense rainforest, including cloud forest, leading to the western border with Songia and the Rayana river. The centre of the country is mostly flat with significant drainage, leading northwards to lower altitude highlands. The northern part of the country, which lines the Axackal sea, is also mostly flat, with significant hills and valleys to the northeast. The Questarian far-west, the Nampataland, is also generally flat after the descent of the Charatry mountain range. Questers is host to seven major Köppen climates; the eastern coast and south-central interior has three tropical climates: wet and dry (Aw/As), wet (Am), and rainforest (Af). Parts of the north and especially the west are considered hot semi-arid (BSh), whereas other parts are humid subtropical (Cwa). Significant parts of Questers mountainous areas are classified as subtropical highland (Cwb), with smaller parts considered humid continental cool summer (Dwb). 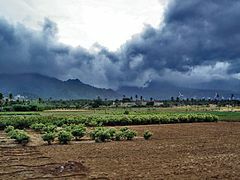 Questers has a two-season, dry/wet climate; the most distinctive and outstanding feature of the Questarian weather is the monsoon, a seasonal period of very heavy rain arising from temperature imbalances from the Oryontic ocean and the Crataean mainland. Questers has two monsoon periods; one arising from the southern Oryontic ocean and spreading west to the south of Questers, which generally occurs between May and October, and a shorter, more northernly monsoon sweeping the whole of the north of Questers, usually taking place between June and September; May is typically the hottest period of the year in all parts of Questers. Questers is a megadiverse country; some biologists have awarded it the title of mostdiverse. The majority of this diversity comes from woodland; in 2010 it was estimated that more than two thirds of Questers is still covered in diptocarp-dominated rainforest - some of these forests are even older than the Questarian mountain ranges, with an estimated age of up to 130 million years. A monsoon brews in Herat. The Tiger is considered a national animal. With a lack of central environmental regulations, the ecological effects of economic development have severe, both in terms of deforestation, species extinction, and general pollution. Many Questarian cities, especially along the Yamuna-Ghaghara industrial belt, and larger metropolitan cities such as Jesselton and Kuala Pahang, have severe air pollution which affects both quality of life and physical health. Some settlements have attempted to enforce environmental regulations, with limited success; in most parts of Questers, air and water pollution is getting worse. However, a general cultural shift towards conservationism, beginning in the 1970s and continuing to the present day, has resulted in the establishment of several large national parks and nature zones, patrolled by privately-funded park rangers in order to prevent poaching. In some of theses zones, natural life has begun to take hold again where it was previously at risk. Questarians donate significant sums to conservation charities. Questarian estatists raise private military units in order to protect their supporters from bandits, foreign invasion, and to keep the peace. These private military units are in some cases simple part-time militia, but can range to regiments of main battle tanks. Private military units are referred to collectively as Yeomanry. Estatists are bound to contribute some of their Yeomanry forces, either full-time or part-time reservists, to a pool of combined military forces known as the Marshalcy; the Marshalcy also raises its own units directly, and is paid for by the funds collected by the Defender of the Faiths specifically for national defence. The Marshalcy includes an air force known as the Pilotcy, and an intelligence agency, the Raj Spymaster-General. The Marshalcy is only a small standing army at approximately 330,000 men, with the bulk of its forces deployed in the Nampata-Yehud Frontier Force. In times of war, Questarian estatists contribute to campaign rounds, raising funds for military operations, and contribute their own part-time reserve units, which could raise the trained strength of the Marshalcy to around 1.2 million men. Annual peacetime spending on the Marshalcy is approximately $100 billion; Estatists spend an extra $100 billion annually maintaining Yeomanry units. The majority of Questarian equipment is built in the Commonwealth. Fully activated, the Marshalcy possesses around 3,000 main battle tanks, 3,000 artillery pieces and 1,000 combat aircraft. In addition, it maintains nearly 60 redoubts, ranging from company to regiment sized fortifications, across the Nampataland. Questers does not have an admiralty, but funds a series of naval and air installations called Crataean Bases Questers, which are large enough to base three-quarters of the combined Estates Navy and North Point Sea Command in case of a general war. The Axackal Squadron, funded by New Senland, is a small naval force designed to close the Axackal Straits to submarines until the Estates Navy can completely seal the Western Oryontic. Questers is often called the breadbasket of the Commonwealth. The economy of Questers is the 3rd-largest in the world by purchasing power parity, with estimates on its total size ranging from as low as $5,900 to as high as $7,800 billion. It is supported by the world's 2nd-largest workforce of nearly 230 million people, and is characterised by rapid economic growth, massive income inequality, and an almost complete lack of central authority, including no de-jure currency, weights and measurements, or financial regulations. Questers, as part of the Commonwealth, operates in a de-facto common market with Praetonia, Cockaygne, and North Point, with these countries having adopted common customary rules for commerce. More than 75% of Questarian trade is with these three countries. The Questarian economy is heavily diversified, as Questers is often considered as a patchwork of more than 1,500 territories, rather than a single central nationstate. The Questarian civil war seriously affected the economy, causing large redistributions of land and wealth, but despite a three-year economic recession as a consequence of the conflict, the economy has seen considerable growth since 2014. Significant economic growth is centred around construction, agriculture (as Questers is a major agricultural exporter, often called the breadbasket of the Commonwealth), raw materials, especially rubber and petroleum, heavy industry, transport, and insurance services. The lack of a central state means that gathering economic data about Questers is difficult, but GDP estimates by international and domestic analysts confirm the country's position as the 3rd or 4th-largest economy, with GDP ranging from as low as $5,900 to as high as $7,800 billion. The decentralisation of governance also means that tax revenues are nonexistent, although those who govern territories impose charges, rents, and customs duties as normal states would, gathering funds to pay for common security and occasionally transport links. Tax-equivalent revenue collection, that is revenue collected to fund public projects, is approximately 7% of GDP. Remittances form a vital part of Questarian trade, with both Questarians abroad sending money home and migrant workers from the rest of Crataea sending money earned in Questers out. Questers is home to an estimated five to ten million guest workers from other countries, and a similar number of Questarians work abroad on a temporary basis. Questers does not have a legal tender, and Questarians use a variety of currencies. The most commonly used currency in Questers is the same as in Praetonia, which is the Guinea of the Commonwealth Banking Confederation, a standards organisation which guarantees the financial soundness of currency-issuing bodies. Guineas are divided into twenty shillings, which are divided into twelve pence each. While in theory any currency can be accepted, most major financial institutions prefer CBC-verified Guineas. Although Guineas are the most widely used currency in daily life, the Oryontic Dollar, a currency issued by a union of Questarian-Praetonian-North Point financial institutions is the most widely used for trade in goods and services between the three countries and acts as both a medium of exchange and clearing currency. The Oryontic Dollar is rarely used in real life and bills are not issued for general public use. Vaccinations are often offered free of charge in Questers, if they are proven and affordable. Although healthcare is entirely private in Questers, estate authorities often provide vaccinations free of charge for residents, and in the later part of the 20th-century began to consider public health as a serious undertaking. The majority of major cities in Questers have functional sewage systems and other public health institutions in order to prevent the spread of infectious and communicable disease. Nonetheless, health provision is heavily dependent on a person's household income. This disparity can be seen in disability-adjusted life years, which in prosperous parts of Questers such as New Senland and Katagalugan can be as low as 430 years per 1,000 people; less developed parts of Questers can lose up to 700 years per 1,000 people, chiefly based on mortality. Other metrics range similarly; maternal mortality in Landing was 26.4 deaths per 100,000 live births in 2015, contrasting to 450 deaths in Nampatabad in the same year. Total expenditures on health in Questers were approximately 8.5% of national income in 2018. Higher-income families tend to purchase health insurance from Praetonian or North Point medical insurance firms, which might even include the cost of transferring a patient to an overseas hospital; there are also hospitals funded by these medical funds in Questers too. These medical groups compete with cheaper domestic hospitals and clinics, and also with local surgeries for those on low incomes without medical insurance. Medical personnel are registered with licensing boards that act as standards organisations. In 2018 Questers had 1.133 physicians per 1,000 people registered with AAA and AA medical licensing boards, and 1.85 practicing physicians either registered with BB or CC licensing boards, or totally unregistered. The Golden Temple, an important religious site for Sikhs. Questers is a multi-religious country in which practitioners of every religion can be found. Approximately one half of the people in Questers follow Dharmat; the other half follow either Praetannic Free Congregationalism or Agama, a form of Congregationalism heavily influenced by local religious and judicial theorists. There is a significant minority of people who practice traditional Crataean pantheon religion, including Dumani and Songian folk religions, but Questers is chiefly a Dharman and Congregationalist country with little Oswinist influence. Religion plays an important part in daily life in Questers; social surveys consistently find that religion is an important moral and social foundation for over 90% of Questarians people. Questarian poly-centric law provides a firm basis for religions to co-exist, allowing different estates to enforce religious laws without impacting worship in other, neighbouring estates. Despite wide variance in religious practice, Questarians are united under the Praetonian common law's doctrine, and both common law and Congregationalism constitute the basis of the country's social order. Minority religions tend to concentrate in areas where they can avoid persecution. Part of a squat in Jesselton. Squatters is a term used to describe persons who live in unlawful settlements. These settlements, known as squats, can range from being just under a hundred people to more than a hundred thousand. Squats can be discrete; the squats of New Senland are often almost next door to lawful cities, and sometimes nearly as large; or they can be indiscrete, with settlements containing a patchwork of unlawfully-occupied areas, common in the Ghagharaland and Yamunaland. Squats typically become larger during wartime or times of poor economic performance, and are a source of tension for those who live in the squats and those who live next to them. Although squats are occasionally demolished, squatters merely move to other parts of the country, and the cost of demolishing a squat is often high, so that landowners typically prefer to attempt to extract minimal rents from squats. Although Questers has many distinct regions with their own individual cultures, Questarians typically consider their country to have a universal culture which sits alongside local cultures: this includes the primacy of family, including extended family; a common and complex code of manners regarding the treatment of strangers, especially those from other religions; and commonly consumed cuisine, film, and sport which are sufficiently compelling to bind together a country of 340 million people, four religions, and more than fifteen major languages. Butter chicken, or murgh makhani, is a traditionally North Questarian dish widely consumed in Orissaland and New Senland. Questers has a variety of regional cuisines which are distinct from an overall national cuisine. However, Questers has two major agricultural staples of rice (in the Herat basin) and wheat (in the Nampataland) which provides the country with two major staple food sources. Both white and brown rice are popular, as well as Malayan coconut-based styles. Most bread consumed is unleavened flatbread such as chappatti and roti canai; chappatti has often been called the national food of Questers. In addition to these sources, various Questarian ethnicities have cultural prohibitions on the consumption of both beef and pork, making goat and fish a major meat source. The wide availability of spice, which is also a major export, has caused curry to become a predominant form of cuisine in the subcontinent. Curry in the south and centre of Questers is heavily flavoured by coconut, with dishes such as yellow curry and laksa being popular and well-known dishes. In the north of Questers, aromatic, ghee-based dishes such as rogan josh, murgh makhani, and laal maans constitute a universally recognised style of national cooking. The high number of vegetarians, coupled with Questers traditionally low-income economy, has led to the proliferation of vegetarian curry dishes, usually based around chickpeas and lentils such as dal bhat or other leafy vegetables such assaag. In the south of Questers, fruit and shoot salads such as green papaya salad and kinilnat have recently become popular across the whole country. Street food is common across the whole of Questers, and regional styles of street food are often joined to make street fusion food, which has spread to other parts of the Commonwealth. Typical street food includes meat-based snacks such as satay, bowl-based dishes such as pad thai, and smaller snacks like pakoras; the variety of fillings available in both pakoras and samosas, which can be adapted to foreign cuisines, means that these two dishes are often a foreigners first introduction to Questarian food. Curry houses also represent Questers on the world stage for cuisine, although they are less common in Questers itself. The most common drink in Questers is tea, commonly called chai, which originates from northern Questers. Most forms of tea, including black, oolong, and green tea are commonly consumed in Questers and have been widely exported; Questarians rarely add fresh milk to tea, although condensed milk is occasionally added, as in teh tarik. Tea is significant in Questarian culture, as it is both cheap and popular. It often forms the basis for most social or business meetings. Coffee, which is grown in Questers, is also widely consumed. Kopi tebal (thick coffee), a Herat-style of drinking coffee in which roasted coffee is cooked and, during the process mixed with condensed milk and double cream, has sometimes been called the national coffee drink of Questers, and can often be sold by street vendors for as little as $1 a cup. Many Questarians drink alcohol, the most common being beer; the Questarian climate is unsuitable for the production of wine, which is only rarely consumed and usually as a sign of social status. Wallasean drinks such as whisky and gin are very popular, but locally produced spirits such as palm toddy or rice whisky are more popular amongst working-class Questarians: street stalls selling rice whisky by the shot measurement constitute the basis of social life for many working-class Questarian males. Sports constitute a major past-time for the majority of Questarian people, whether it be watching or playing. No single ethnicity claims one given sport as its own and sport, alongside food, is a major multicultural meeting point for Questarians of different ethnicities and religions. The most popular sport is certainly cricket, with Questarian football and rugby coming second and third. Clubs for every kind of sport can be found in most Questarian settlements; in addition to popular sports that can be followed by anyone, sports for the elite such as polo and golf often form the basis of country clubs, admission to which can often depend on a persons skill in a given sport, as well as their social standing. There are three kinds of sports leagues in Questers; those based around geographical areas, such as cities or counties, those based around internal competition between large military units (such as the Yeomanry League), and those centred around universities. These leagues do not run concurrently and it is common for players to transfer between them. Sports players in Questers are often not well paid, and many sporting celebrities are in fact amateurs. Questarian teams often compete with teams from Praetonia, North Point and Cockaygne in these sports. An abandoned temple in the Nampatan mountains. This page was last modified on 9 February 2019, at 05:01.